Offer expires on January 15th, 2013. Create delicate Flash and HTML5 flipbooks. Publish flipbooks online and share with your clients, colleagues and friends. Use virtual printers to convert any printable file. It supports over 50 target text and image formats and all printable-file formats. Convert PDF to Word (DOC, DOCX and RTF) format. It also provides a command line tool that can be used in a script. Recognize characters in scanned image PDF and save as Word. 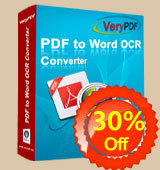 It supports batch process that can convert multiple PDF files with one click. PDF recovery tool to remove PDF password. It can directly remove PDF permission restrictions and save PDF without open password. 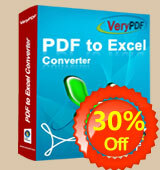 Convert PDF files to Excel spreadsheets. It supports batch conversion of multiple password encrypted PDF files. 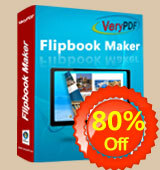 Copyright © 2002 - 2012 VeryPDF.com, Inc. All rights reserved.